Based on Adam Dunkel's uBasic, SDM supports a subset of the CHDK scripting commands and introduces some of its own. Most users will use publically-available scripts or, if writing their own, will use relatively few of the available commands. For reference, the SDM-supported commands are listed below. Dave Mitchell has written a debugger for SDM uBasic scripts, you can download it here. If writing your own scripts, use a simple text editor (such as Notepad or Wordpad) and save in plain ANSI format (not unicode). Make sure that the first line of your script is not blank but there is a blank line at the end of the script. Any lines above '@title' should start with 'rem'. If the script is named Startup.bas and 'autostart' is enabled in the Script menu, your normal default script will still be resident on completion. To create a parameter set for a particular script, copy-and-paste the script @param and @default fields to a text file. The text file should have the same name as the script but with a numeric (0 to 9) suffix to indicate the parameter-set number. The extension should be .TXT and the filename should be no longer than eight characters, including the suffix. Save the file to the PARAMS folder. Script parameter-sets may include four @desc ('description') fields. These descriptions are displayed in the Script menu as you navigate from one set to another. Up to ten sets may be associated with any one script. Set '0' contains the settings last-used with the script. The 'time_lapse' command has the option of using just a single parameter that indicates the parameter-set to be used. e.g time_lapse 5 runs time_lapse with all settings contained in parameter-set '5'. SDM does not require the uBasic 'print' command when displaying text without any following parameters. Simply enclose the text between quotation marks. If preceeded by a space, the background will be blue. If preceeded by a '#' symbol, the background will be green. If preceded by an exclamation (!) mark, the background will be red. The colour-formatting symbols are not displayed. The autofocus LED is bright and visible from some distance. This makes it useful for kite aerial photography (KAP) scripts to indicate completion of operations. Use before the 'time_lapse' command to force autofocusing on every shot. Not to be used if camera set to manual focusing. Use before the 'time_lapse' command to autofocus the first shot. When 'time_lapse' command is executed, autofocus lock (AFL) is applied and 'AFL' displayed at top left of screen. This blinks the autofocus LED for the set time. e.g blink_af_led_for 5 blinks autofocus LED for five seconds. Used in continuous-shooting mode to capture images from focused distance to infinity. The camera must be in a mode that allows focus-override and in continuous-shooting mode. (if using custom timer mode, the sequence will end after the set number of exposures. Focus may or may not reach infinity). For the example below, set camera to continuous shooting. At the wide-angle setting, infinity will be reached in only two or three steps from 1000mm. The example zooms the lens to get more steps (on non 'S' series cameras). The focused distance is displayed at the top of the screen for each step. 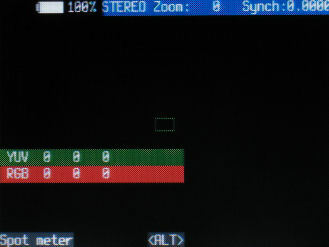 'DBA' is displayed to indicate 'distance-bracketing automatic' and 'CONT' for continuous-shooting mode. Press your USB switch to start, the camera will beep when infinity-focus is reached. Makes a brief 'beep' sound. Turn the blue LED on/off. Returns '1' when all bracketing shots have been taken. Disables USB upload and returns to record mode. This will only work with programmes on the PC that have already exited in a controlled manner. Changes current shutter-speed (exposure value) by the required number of 1/3 EV steps. When using the 'send_data' command to send three bytes of data to an external device (such as a Picaxe microcontroller), a returned value of '1' indicates that the data was received without error and the device replied within 100 msec. e.g data_received a ('a' = 1 if data received). Used to capture a number of images focused each side of the scope virtual image. The camera must be in a mode that allows focus-override and continuous or custom-timer shooting. Focus value is displayed at the top of the screen and on completion the camera refocuses at the starting distance (reference focus). The Canon firmware may not focus at a precise numerical distance, just as close as it can get. When USB download is disabled, the camera will not try to connect to the PC when a voltage is present on the USB connector V+ pin. This is the usual mode when using a remote switch. By enabling USB download and switching to Playback mode, a selected programme on the PC will startup when the USB connector plugged-in. Used before starting a Tv (shutter-speed) bracketing sequence with custom-timer shooting mode. (continuous-shooting mode bracketing is alternating only). For the example below, set number of exposures in custom-timer 'Shots' and delay to zero. This is a synonym for 'finish_time' and is used in conjunction with 'sleep_until' or 'start_time'. 'end_time/finish_time' MUST come before 'sleep_until/start_time' in your script. It indicates the time in hours and minutes that an operation should end. At present, only 'time_lapse' command supports this feature. The following script will blank the display until start time (default is 12:30) . It will then take a photo every minute until end time.
. The time-lapse setting for this feature must be 'endless'. Used to capture a number of images using a fixed focus-step from a start focus. Useful for extreme close-ups where depth-of-field increasing very slowly with focus distance. Synonym for 'end_time', you can use either. This is a synonym for 'get_focus', you can use either. Returns the focus position (on the virtual image) used by digiscoping function. Returns the horizontal field-of-view (in degrees) in the supplied parameter. Returns the current speed (1 to 5) of the script. See the 'set_script_speed' statement below. Returns synch status and delay values. See 'set_synch' below. Used in Tv bracketing to specify the exposure-step in units of 1/3EV. 3 EV is equivalent to one stop. Captures multiple stacks of images from current focus to infinity. Each stack forms part of an exposure-bracketed series. The first parameter is the number of stacks, the second is the exposure-change (in 1/3 EV units)between stacks. Returns '1' in 'a' if true. Toggles on/off state of the LCD by 'pressing' the DISPLAY button. Not supported by all cameras. Print script output directly onto one of the script-console lines without scrolling. See the readYUV script example below. After half-pressing shutter and giving camera sufficient time to focus, the auto-focus may be locked. 'AFL' will be displayed on the screen. You may unlock autofocus using the script command or half-press shutter button and press right button until 'AFL'not displayed. Loads the edge-overlay stored on the memory card. Switches to playback mode and enables USB upload. The camera switches to movie mode. Clicking "shoot_full" will start and stop the movie recording. For cameras with a 'movie' button, 'movie_mode' does not do anything. Normally, it is simpler to use the command 'shoot_movie_for' described below. These perform same functions as 'set_nd_filter' but are easier to remember and make your script more readable. Used to specify the number of images in a bracketing mode. For Tv bracketing and digiscope bracketing this is usually an odd number. Normally, edge-overlay mode is disabled on power-up, even if you powered-down with it enabled. If the script is named Startup.bas, your normal default script will still be resident. Camera switches to playback mode. Reads the luminance and UV chroma values from a 24 x 16 pixel area at the centre of the screen. No parameters are required, the values are returned in 'a', 'b' and 'c' (so be careful how you use them in the rest of your script). 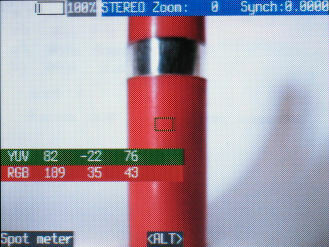 To use as a spotmeter, zoom to telephoto setting. The values are read from the live-image buffer and the correlation with the real scene values is not known. Returns to record mode from playback mode. Restores the camera focus to the value previously saved with 'save_focus'. An optional parameter will contain the focus-setting value. Useful for long time-lapse sequences (especially with Eye-fi cards) that use hardware or software methods to reset the camera at intervals. Restores the lens zoom position to the value previously saved with 'save_zoom'. Without a parameter, saves the current focus setting as measured from the front of the lens. Optionally, provide a numeric value for the required focus setting. The value saved may be inspected in Bracketing/Overrides as 'Saved focus' and even manually changed for reading by the 'restore_focus' command. In bracketing modes, this command enables the saving of log files with the focus or Tv values recorded. The command should come before any command that starts the bracketing sequence. Try adding it to the top of Example 2. The log files are in folder 'A/CHDK/STACKS'. Saves the zoom step of the current lens position. This command sends two or three bytes of data to an external device by flashing the Print or autofocus LED's. If only two bytes are used, the data is sent once, otherwise it is sent twice to enable error checking. The commands 'use_print_led' and 'use_af_led' allow you to choose either led. The autofocus led is far brighter and may be easier to attach an opto-sensor to, especially if the camera accomodates an accessory-lens adapter. The following script sets parameter 'a' to 128 as a parameter identifier, you can choose any value you wish from -128 to +255. if b <> 7 then goto "loop"
if b >= 0 then goto "loop2"
Sets the reference-focus position (on the virtual image) used by digiscoping function. Sets size of focus-step to be used for equal-step bracketing. The 'set_focus' command may optionally have a second parameter that returns the next distance to focus on when focus-stacking. When infinity is reached, -1 is returned. This automatically results in increasingly larger focus-steps. Instead of executing one uBasic statement every 'tick' (1/100 sec), you can set script-speed up to five statements per tick. At the start of the script, the speed is set to one statement per tick. This will speed-up many operations, but not all. Sets zoom to defined position, starting from step '0'. Switches to movie mode,records a movie for the defined time and then returns to record mode. This is an aid for detecting camera-shake when shooting in dim-light conditions or at the telephoto setting. The photo is only taken when there has been less than a user-defined amount of movement. The location of the monitored points is shown with an overlay of small rectangles and these aid sighting a reference object and keeping it steady. 'a' is the sensitivity (1 to 255) and 'b' is the returned value. The smaller the value of 'a', the more sensitive is the shake detection. The command times-out after ten seconds if camera not steady enough. A return value of '1' indicates success, no shake detected. This is intended for longer time-scales than the 'shoot_when_camera_steady' command and takes a photo when there has been no subject movement for a defined amount of time. Possible applications include kite aerial photography and microscopy. a = required duration of no movement in seconds, a minimum of '1'. b = return value, '1' is no movement detected. c = movement sensitivity (optional), range 1 to 255. Set to 128 if not specified. d = time-out (optional) in seconds, set to 10 if not specified. A user-friendly way to enter override shutter-speeds over the range 64 to 1/32,000 sec. (it is not suggested that high shutter-speeds beyond the camera's native maximum are 'real'). Script pauses for defined number of milliseconds. Script pauses for defined number of minutes. Script pauses for defined number of seconds. The camera blanks the screen and waits until the set hours and minutes before continuing. With the following script, the camera sleeps until 12:30, shoots a fifteen second movie and then beeps to indicate completion. This command is used to start a Tv or focus-bracketing sequence when the camera is in continuous shooting mode. Unlike custom-timer sequences, you are responsible for ending the sequence. In effect, you are taking your finger off the button. This command is used to start a Tv or focus-bracketing sequence when the camera is in custom-timer shooting mode. There is no need to explicitly end the sequence although you need to use 'wait_until_done' before executing next command. Set number of exposures in custom-timer 'Shots' and set delay to zero. 'TvB' will be displayed to indicate Tv bracketing and 'TIME' for custom-timer mode. Synonym for 'sleep_until', you can use either. These perform same functions as 'set_sync' but are easier to remember and make your script more readable. A very versatile command for time-lapse with bracketing,focus-lock, screen blanking, auto-shutdown and USB stop/start. This is the default script provided with the download. See separate section for full details. This command allows you to 'tweak' the value of the pulses used by the 'send_data'command. The receiving device (such as a clickPAN-SDM) should have a mode that measures this pulse-width and indicates if it is within the required range. The default value is '22'. This command works on all cameras to turn the backlight on/off. After image capture, the backlight will briefly turn-on again. For example below, press shutter button to start script. The 'send_data' command blinks the Print LED for unit-pulse time or multiples thereof. In order to set the time as accurately as possible, use this command to generate a single pulse that the connected, external device can then measure. In the Serial Comms menu, you set the time in increments of ten msecs and can apply a tuning factor to vary the pulse-width. The variation in pulse-width will be greater for short pulses and you should choose a value that gives reliable results. Switches to playback mode, enables USB upload for defined time and then returns to record mode. This command may be used with WIA-Loader to upload images at regular intervals. Use the autofocus led to communicate with an external device (using the 'send_data' command). Use the PRINT led (if available)to communicate with an external device (using the 'send_data' command). Script pauses until voltage signal present on USB V+ pin. See the various examples above. Signal can be from a switch, IR or wireless receiver, microcontroller, etc. Indicates that required number of images in a custom-timer or continuous-shooting mode sequence have been taken.